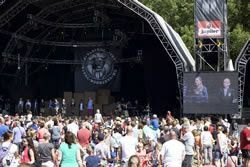 For the third consecutive year, Icon Broadcast Group, a full service audio-visual production company based in the Netherlands handled the live operations at VESTROCK festival. Held in Hulst, the festival focuses on music, art & science and combines performing arts, theater, street art, illusionists and more. Performance stage at VESTROCK festival. received feeds from 12 cameras, including IP cameras installed above the stage to shoot scenes from the top. Paired with the TriCaster was LiveCG Broadcast and LiveXpert – a multi-layer graphic generator in a 1U rack that generates graphics, crawlers and banners for live productions. LiveCG Broadcast works with any video mixer, and connects with all TriCaster systems through an IP connection. LiveCG Broadcast includes an application called Social Hub. The application, made for external computers, has the ability to connect with multiple social platforms, retrieve and monitor their feeds, and publish a selection of their messages instantly. On another "virtual machine" they installed an Android operating system with WhatsApp application to receive text messages from the “Meeting Point,” an area for lost children. The text messages were broadcasted using a LiveCG Broadcast. Programming the Social Hub and other applications made them accessible outside the OB Van, on an iPad, in the festival public relations office and on the field.